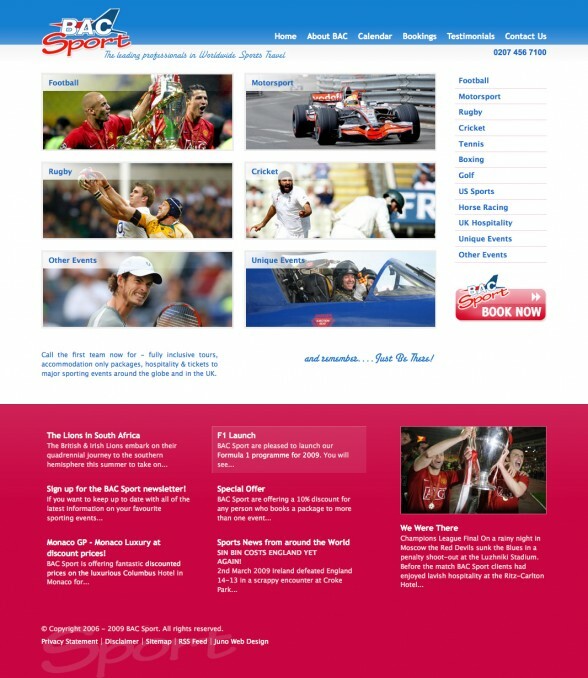 We discreetly launched the new BAC Sport website design a month ago. BAC Sport is an experienced sports tour operator, specialising in arranging sports tours for individuals and Corporate Groups, to all of the major sporting events worldwide. BAC Sport came to us through recommendation from another client, they had a shocker of an existing website with dated design and build quality and no management functionality. Freedom to update and post company news, offers and packages was non existent incurring regular unnecessary cost. We have built a site that represents the vibrant brand and large quantities of information in a way that is easy to navigate and with a contemporary design. The site in three weeks since launch is page one of Google for their main search term ‘sports tour operator’ and a range of relevant searches and we hear that increased sales are noticeable which is great news.